Boil a the tomatoes for one minute. Remove, de-skin and deseed tomatoes and chop finely. Keep aside. Boil cauliflower florets with a pinch of turmeric powder. Drain and keep aside. Heat the butter in a pan, add cloves, cinnamon, cardamoms red chillies. cumin seeds and chopped garlic. Combine with the onions, ginger, garlic, tomatoes, turmeric and chilli powder. When these are half done add cauliflower, capsicum and salt to taste. Cover and cook on low heat. When vegetables are done add, fresh red chilli paste and tomato ketchup. Stir well. 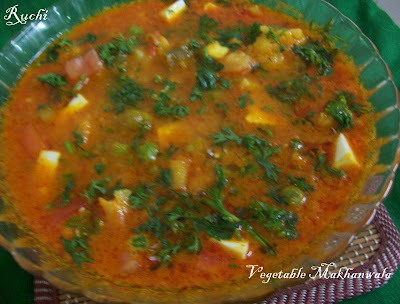 Add boiled tomato puree and paneer cubes and saute for a minute. Cover and cook for 5 minutes. Add fresh cream and Serve hot garnished with the coriander. wish to hav this with parotta,sounds very nice! yummy recipe, first time here. bookmarked ur receipe. Thats a beautiful and utterly delicious makhanwala...i would like to have some for my rotis today..yumm!! nice recipe, akka. will surely try this.